The developers of concentrated solar power (CSP) plants have asked the Central Electricity Regulatory Commission (CERC) for another extension after their commissioning deadline expired on March 9. The first ten-month extension given to six of these projects, which were started in 2010, was given in May last year. The failure of these projects to meet the extended deadline for commissioning means their bank guarantees would get encashed. Keeping in mind the request made by developers, CERC has forwarded the case to The Union Ministry of New and Renewable Energy (MNRE) and put on hold any move to encash bank guarantees worth about Rs 590 crore for about two weeks. The MNRE has been asked to respond within stipulated time. The projects, according to some sources, are expected to get another extension this time. CSP plants use curved mirrors to concentrate sunlight, which is then converted into high temperature heat for generating electricity. Out of seven CSP projects under phase 1 of Jawaharlal Nehru National Solar Mission (JNNSM), six are running behind schedule. None of the projects, except the 50 MW Godavari Green Energy, could meet its initial commissioning deadline of May 9, 2013. As a result, MNRE extended the deadline by 10 months and put the encashment of bank guarantees on hold. According to some MNRE officials, six developers, including Lanco Infratech limited, Reliance power and Corporate Ispat, had filed a petition before CERC sometime before March 9 this year and asked for further extension and tariff revision. CERC then referred the case to MNRE. “Our technical team is looking into the matter,” said an MNRE official who did not want to be named. The official also said that the projects could be given further extension because the developers have genuine demands. “The use of CSP technology for power generation on large scale is new to India. None of us had the experience in the technology and how it would perform in Indian weather conditions,” he added as he informed that even the commissioned 50 MW Godavari’s plant in Rajasthan is not generating power to its full capacity and is facing technical problems. For example, the temperature drops so low in the night that the Heat Transfer fluid (the chemical that absorbs concentrated sunlight and heats up the water and turns it into steam) gets cold and takes a lot of time to get heated next morning. “The region is also experiencing a lot more cloudy days than expected,” he said. 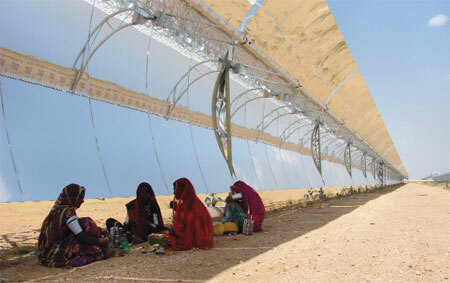 The projects have been facing a financial crisis as banks have not been providing money to a relatively new CSP sector. “But now, after much persuasion and some experience on ground, banks are gradually gaining confidence and things are looking much better,” said the official who also said that Reliance’s 100 MW plant in Rajasthan and Megha Engineering’s 50 MW plant in Andhra Pradesh are expected to be commissioned in a month or two. “We need to give confidence to the sector so that it can grow. If we behave very strictly, the sector may never grow,” he added. However, whether a further deadline extension is possible or not will be decided only after the recommendations of MNRE’s technical committee.